Rome in 3 days: 10 things to do! As I mentioned in yesterday’s post (if you missed it, you can read it HERE), I spent the last weekend of July in Rome! 3 days are surely few, but enough to discover a beautiful part of the many wonders that make Rome one of the most fascinating and exciting places to the world’s eyes… And that makes it the eternal city. Here’s my personal list of 10 things not to be missed if you are visiting Rome! Recently reconstructed thanks to Tod’s, now the external facade of one of the symbolic monuments of our country is even more beautiful. As for the inside, however, the work is still in progress, but I must say that there is no comparison with the past. In my recent trip to the Marche with Tod’s (which you can read about HERE), I had mentioned that I was about to leave for Rome and they were kind enough to arrange a private visit to the Colosseum… I could not ask for more ! Thanks again Tod’s and thanks to Andrea, my sweet guide, for being super helpful and for making me live a piece of history of our beautiful Italy! I tried several grattachecche in Rome, but that of Sora Maria is unbeatable! She is always there and personally prepares every grattachecca, along with two young assistants. My absolute favorite is called Golosona, and is topped by berries and coconut pieces (it costs 4 €). Super refreshing! It is worth making all the way, being near the Vatican City (more precisely, is located on the corner of Via Largo Trionfale and Via Bernardino Telesio). Pay attention to the opening hours: you do not want to go over there and then find yourself high and dry! The kiosk is open daily (except Sunday) from 15.30 to 20.30 and then from 21 up to 01.30 at night! One of the walks to do in Rome. I would advise you to do it at sunset, to fully enjoy the colors of the sun reflected on the waters of the Tiber. I’ve done it immediately after taking the grattachecca from Sora Maria and before returning to the center of Rome. I reached Piazza San Pietro, now discovering that access is no longer free as it once: there are metal detectors that form a long row, so you have to consider that it takes time before you can enter it. From St. Peter’s Square I turned into Via della Conciliazione and reached the Tiber, then walking up to Castel Sant’Angelo. There I crossed the magnificent and namesake bridge, which is adorned with ten statues of angels, each one unique. So peaceful! Rome is a big city and I recommend you choose a hotel as close to the center as possible. I have stayed at Rome Glam Hotel, the brand new hotel of Mood Hotels group. Opening just a few weeks ago, the Rome Glam Hotel is situated in a prime location, within the Rione Monti, just a ten minute walk from Piazza Venezia and the Trevi Fountain. My room was located exactly in front of the majestic Palazzo delle Esposizioni, as you can see from the pictures I took near the window (only open for the occasion and immediately re-closed, for the many of you who have asked me on Snapchat!). It was a very spacious room with a large desk to work comfortably at the computer and a clean bathroom, provided with every comfort. The most special moment, that I will always carry in the heart, was certainly the breakfast: from sweet to savory, from pancakes with maple syrup to croissants, through fresh fruit, yogurt and cereals… Everything was absolutely delicious and it is offered at the fifth floor, in a beautiful terrace with a unique view on Rome. Among the cult city for shopping is definitely Rome, where you can admire the windows of the biggest names in Italian and international fashion. My eye immediately fell on the bags, which as you know by now are my great passion. Window after window of Via dei Condotti, with all those bags on display, I decided to make myself a late birthday gift… I arrived in Piazza di Spagna, where I saw Valentino boutique and thought it was the right place! I stepped inside, tried various models and sizes but in the end I opted for the one that since the window had stolen my heart! If you’re curious, you can see already some previews of Instagram and Snapchat (@lauracomolli) and in yesterday’s post (check it out HERE)! If you want to stop for lunch while you do your walk, I recommend you to go at Ginger restaurant. It is located near Via del Corso, in a street named Via Borgognona. It ‘s chic, bright and pleasant: it offers very good quality food, smoothies of all kinds of fruit and even vegetarian dishes. The impressive and very white Altar of Patria in Piazza Venezia is worth a visit, even if you are visiting Rome for only 3 days. Walk by it and go to the right, you will find two staircases. Take the second, climb to the top, and you’ll find yourself in one of the most magical spots in which to see Rome from the top: the Ara Pacis monument. From here you can then leave for a visit to the Imperial Forums, and immerse yourself in the ancient history of Rome! If you love fresh fruit as much as I do, I recommend going early in the morning at one of the many local markets that are located in and around the city (I had been in the one close to the Quirinale and Campo de’ Fiori). It’s the right time to find the best fruit and see the newly placed benches! I had not yet had the opportunity to see it live after the renovation, and I was literally speechless! It ‘s beautiful! The colors of marble and travertine, as well as those of the water, are so pleasing to the eyes. 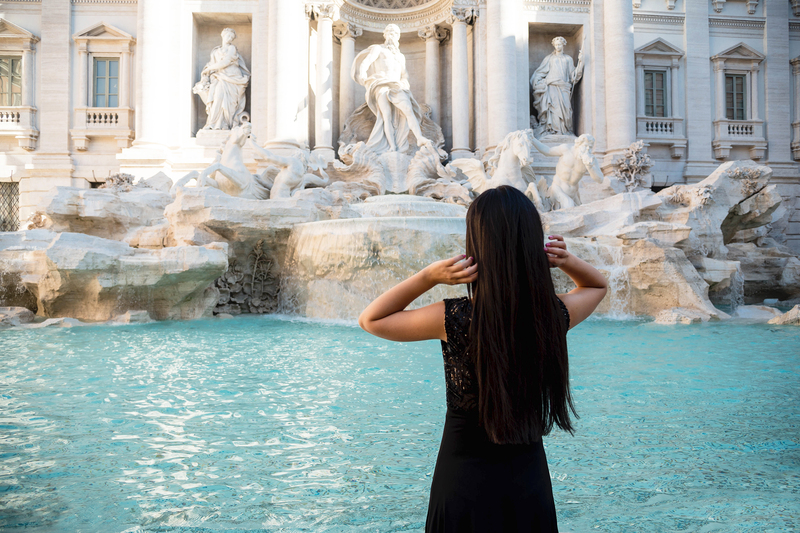 You know you’re getting closer to the Trevi Fountain because, while walking on the street, you already listen the thunderous sound of water. I went on purpose early in the morning, hoping to find a few people and take better pictures. So it was, but I also had another pleasant surprise. Until 8.30 a.m. you can go down to the fountain! Only after after that time you can no longer have access to it. So I recommend you get there early to enjoy the view in peace! The lanes teeming with people, the small squares away from the traffic and the many local restaurants with outdoor area make Trastevere the perfect place to stop and eat. My friend Dorotea (Non Conto Fino A Dieci) brought me to Grazia e Graziella, where I tasted one of my favorite Roman dishes: tonnarelli cheese and pepper! If you’re ever in Rome in summer, know that it is not far from the sea and is worth a day trip to see the coast of Lazio. Before you leave, ask about the presence of bus and taxi, because very often in these areas they are cannot easily been founded, and evaluate the option of renting a car. The finest hour? Surely at sunset, sipping a cocktail barefoot on the sand! I hope you enjoyed my diary of the trip to Rome! 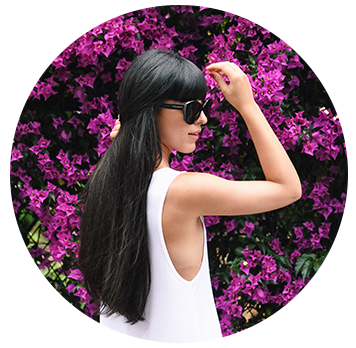 I’m going on holidays, which this year I will spend between Croatia and the French Riviera … Follow me on Snapchat, Instagram and Instagram Stories (the new Instagram update that allows you to post live video lasting 24 hours) @lauracomolli to stay updated in real time! Then I shall return with many new post from August 22nd onwards!